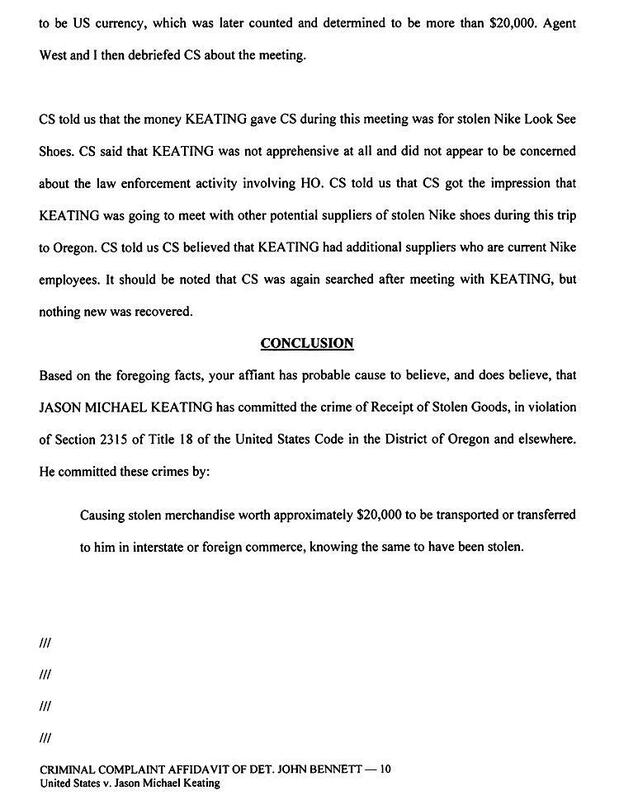 APRIL 17--A federal criminal investigation has uncovered a “large-scale theft” operation inside Nike’s Oregon headquarters, a scheme that targeted valuable sneaker prototypes and involved a Nike product manager, his predecessor at the shoe giant, and a Florida businessman who resold the “extremely rare” kicks to buyers nationwide, The Smoking Gun has learned. 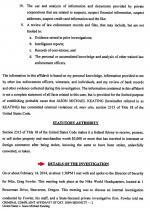 The reseller, Jason Keating, 35, was named yesterday in a U.S. District Court complaint charging him with receiving stolen property. 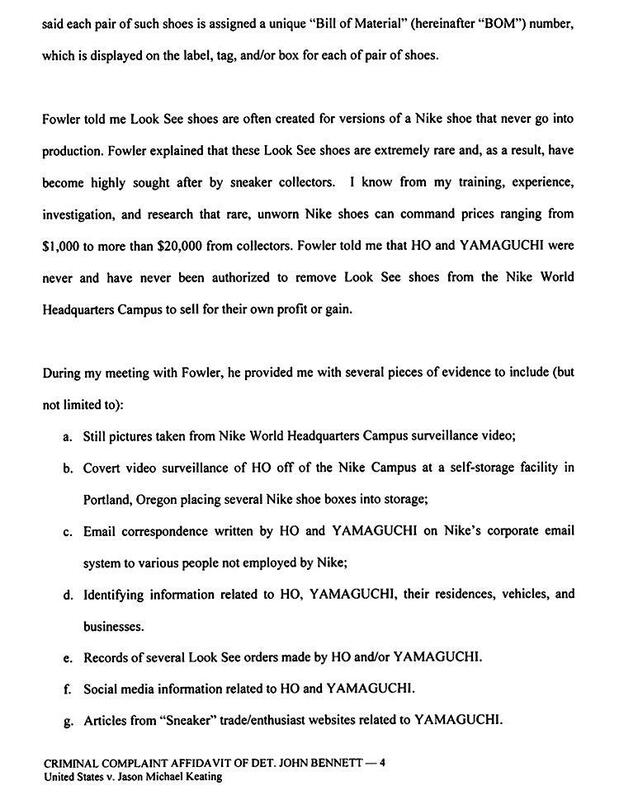 During a raid last month at his Portland home, Nike employee Tung Ho (seen at right) reportedly admitted to stealing “several hundred pairs” of “pre-production or sample” Nike sneakers. 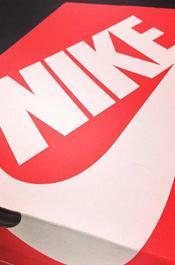 Known as “Look See” models, these pairs are “highly sought after by sneaker collectors” who are willing to pay in excess of $20,000 for shoes that often never go into production, investigators report. 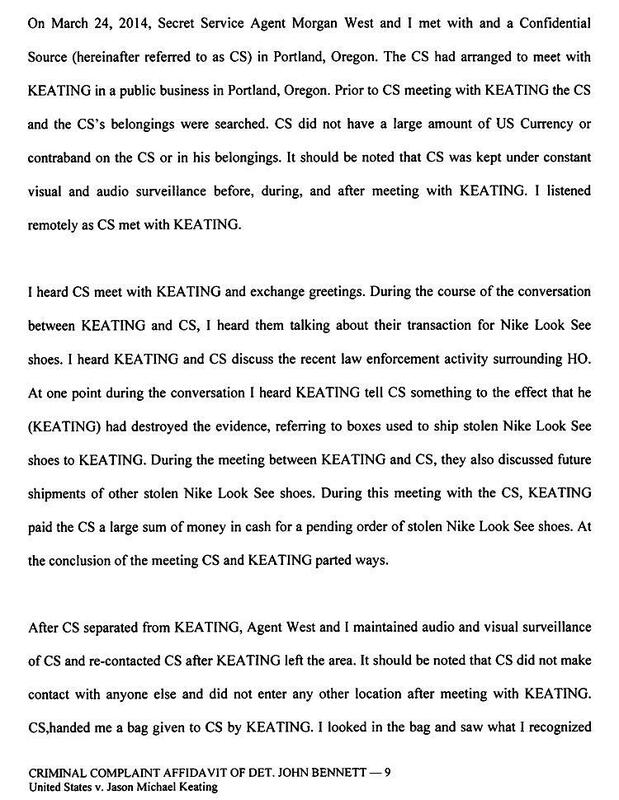 The sale of the stolen “Look See” sneakers resulted in so much money being transferred among the alleged conspirators that JP Morgan Chase Bank officials opened an internal review in late-2012. 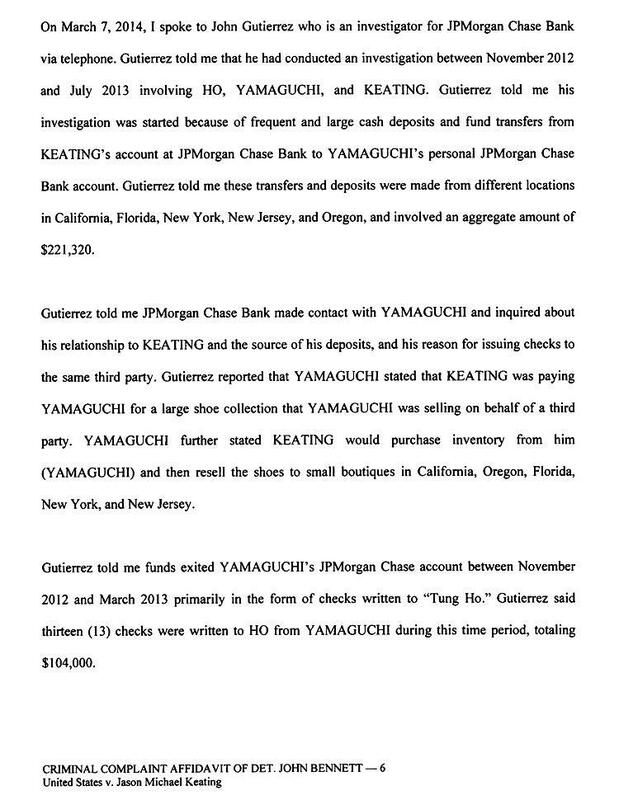 Chase investigators were apparently concerned that “frequent and large cash deposits and fund transfers” made from Oregon, California, Florida, New York, and New Jersey were consistent with a money laundering operation. 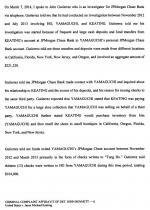 For example, over one eight-month period, more than $221,000 was transferred between two of the scheme’s alleged participants. 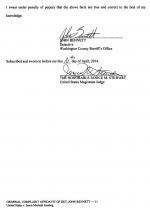 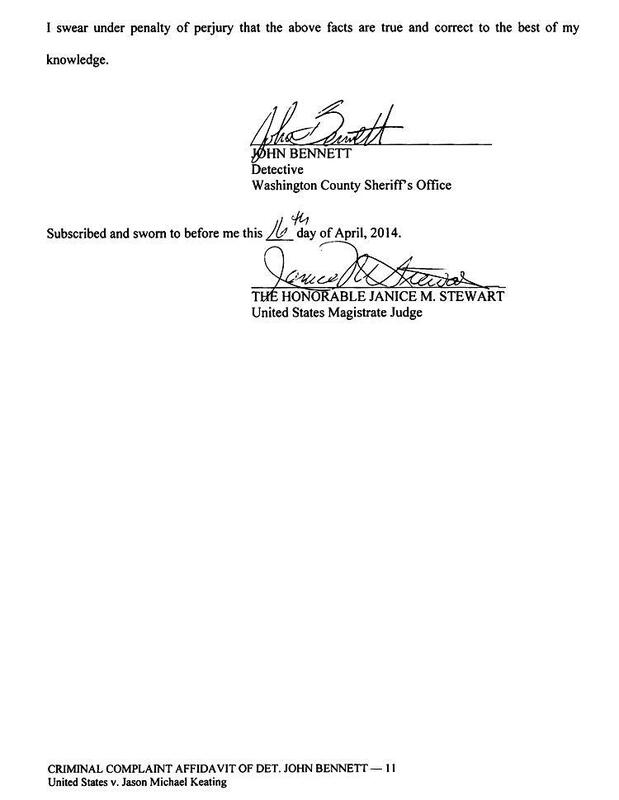 The “Look See” operation is detailed in a federal court affidavit sworn by an Oregon detective and filed in connection with the felony charge against Keating, who was released from custody today following an appearance in Portland federal court. 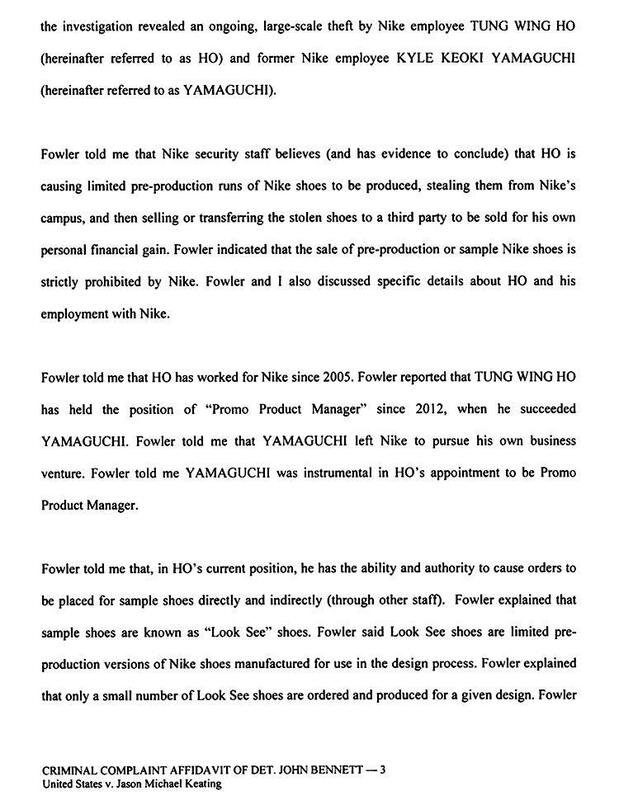 As a “promo product manager,” Ho and Yamaguchi (seen at left) were responsible for creating limited edition basketball sneakers and custom “player exclusives” for a wide variety of Nike endorsers, including LeBron James, Kobe Bryant, and Kevin Durant. 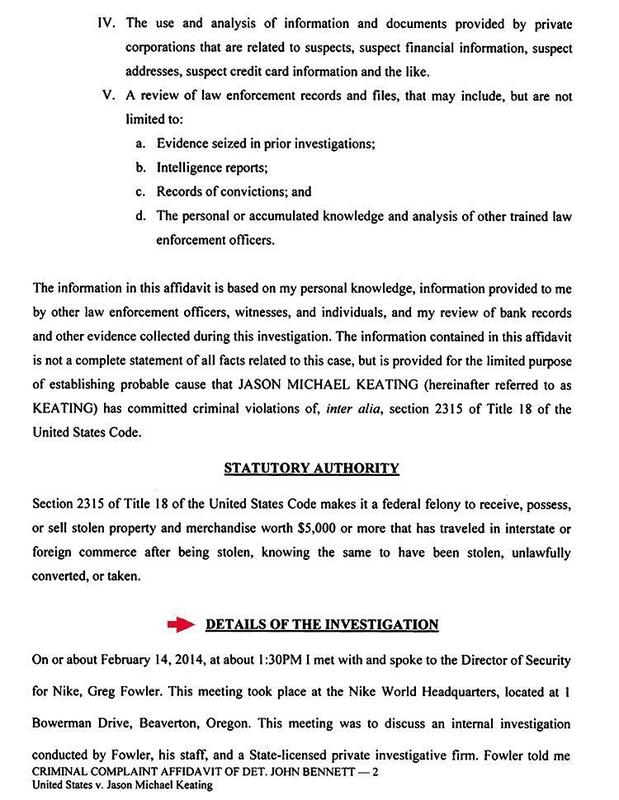 Nike officials told police that Ho had the “ability and authority” to order the production of sample shoes from a Nike factory in China. 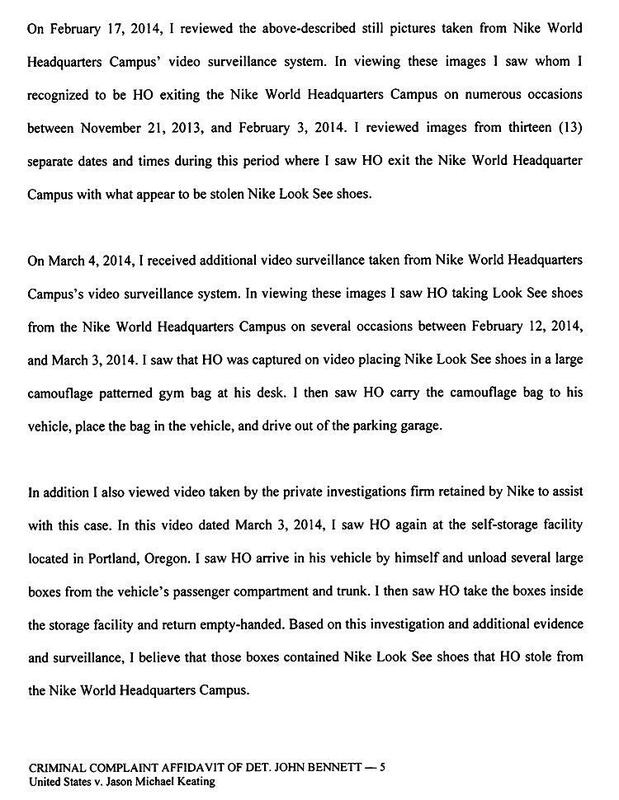 When those sneakers arrived at Nike’s campus, Ho would load them into a gym bag and transport the items to his car. 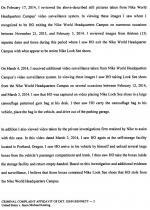 From there, he would drive to a self-storage facility and unload the merchandise. 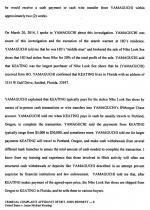 During a four-month period ending in March 2013, Yamaguchi wrote 13 checks to Ho--totaling $104,000--according to bank records cited in the affidavit. 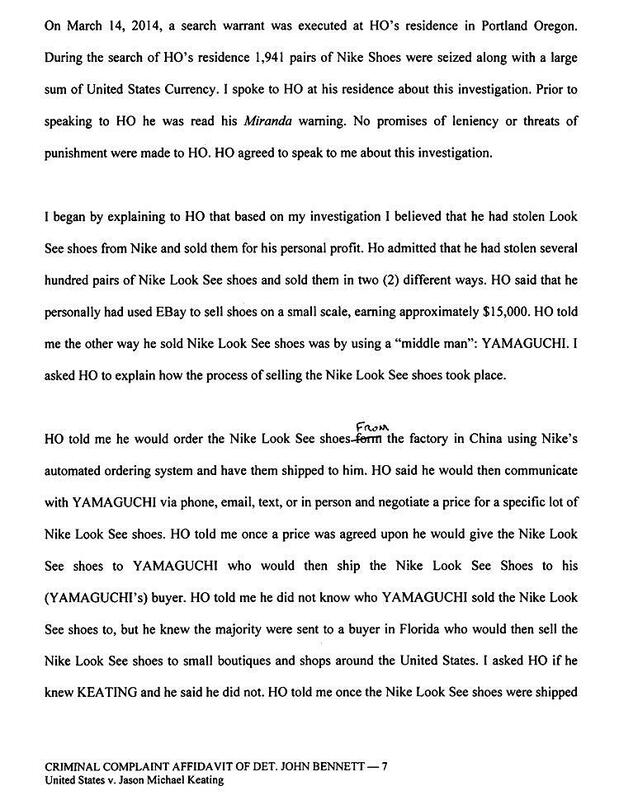 In a March 20 interview with Detective John Bennett, Yamaguchi admitted brokering the sale of the sneakers stolen by Ho in return for a 20 percent commission. 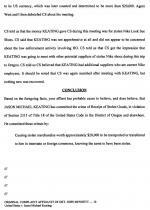 He also fingered Keating, saying that the businessman usually traveled to Portland to make payments that sometimes exceeded $30,000. 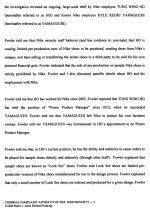 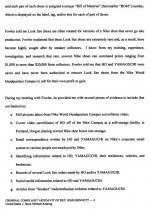 Yamaguchi’s aid to investigators did not end with his interview, however. 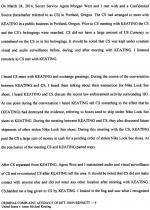 Several days later, at the direction of Bennett and a Secret Service agent, he recorded a face-to-face meeting with Keating. 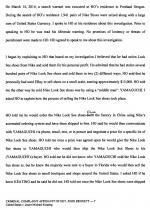 The men discussed “their transaction for Nike Look See shoes,” as well as the raid of Ho’s home. 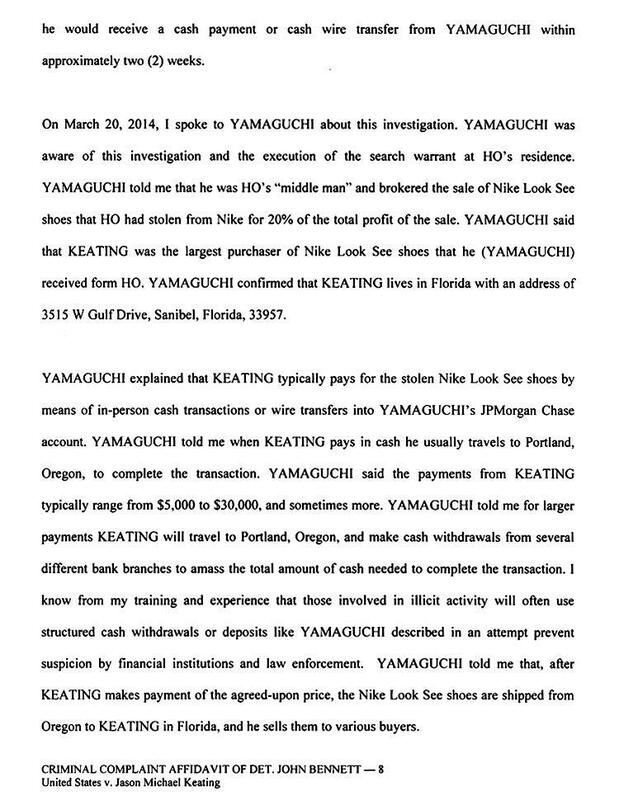 Keating, pictured in the adjacent mug shot, also gave Yamaguchi a bag containing more than $20,000 in cash for “Look See” sneakers.